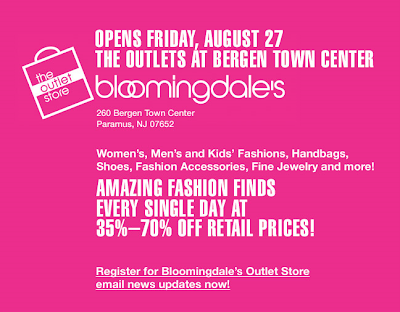 Bloomingdale's opens outlet in... NJ?? This is it! Lots of new markdowns on tons of items. Take an additional 25% off the sale items at Luisaviaroma.com with code "FR25S07H". Ends Monday, Sep 6. Labor Day is coming up, which usually means good sales. Of course, I'll post any promo codes that become available, but now may be a good time to peruse ShopBop's sale section and see if there's anything you must have before the onslaught. As a Manhattanite, it is pretty much my sworn duty to propagate the inferiority of New Jersey, so I'm a little disappointed to say the new Bloomingdale's outlet is in Bergen, NJ. (Also disappointed because this means I will likely never go there.) But if you live around there, I hate you. Because this probably means that the 59th St Bloomies won't go as nuts on its sales, and instead bring all these treasures to you. Fie!! J.Crew's Madewell is clearing out the shelves for fall. Up to 40% off (not ideal, not terrible), and shipping is free for $100+ with code "SCORE". It looks like the theOutnet.com's Clearance Sale is winding down. While perusing the wares, it does seem like they have been additionally discounted... there's not a lot left, but you might want to take another look. Today only, take 15% off a "great selection" of items by using code "FFSAVE" or printing out the email to shop in-stores. 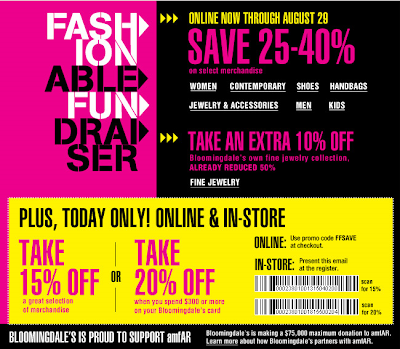 And, if you plunk your $300+ purchase on your Bloomie's card, it becomes 20% off. From now until Sunday, Aug 29, use code "BIG" to take 15% off regular priced and sale merchandise and 25% off clearance items on Lord & Taylor's website. So the roaming gypsy-like James Perse sale moves on. I guess they REALLY want to get rid of this stuff! The GAP companies are doing their Give and Get promotion now. Shop, save 30% and 5% of that will go towards a charity of your choice. That's a very generous total discount from the retailer level! All the GAP, Banana Republic, Old Navy, and outlet stores will accept this (unfortunately NO Piperlime). To start, go here and pick the non-profit you'd like your 5% to go towards. Everyone on their email lists should have gotten a one-time-use online code as well as a barcode for shopping in-stores. Ends Sunday, Aug 29. BDB this week: resale Gucci, vintage Chanel jewelry, Tuleste jewelry, Lomo cameras! This is a good week for Billion Dollar Babes. You snooze, you lose. So hurry! Things are fast disappearing. Some time today theOutnet.com will be starting their clearance sale. Prices will be 80-85% off, so you'll want to make sure you're on their email list and stay close to your computer! 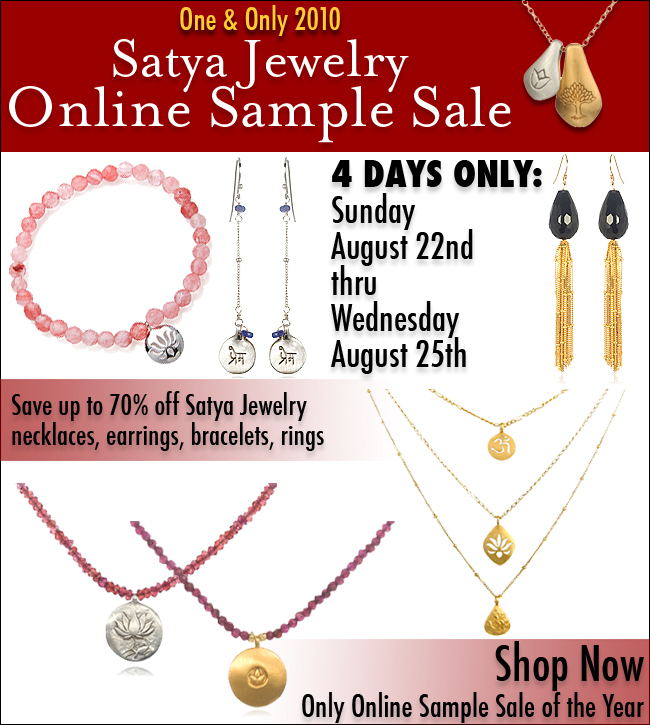 Satya is hosting their one-and-only online sample sale now. Ends Wednesday, Aug 25. Spend at least $500 and get a gift card from NeimanMarcus.com. Use code "BEST GC". Doesn't look like there are any brand exclusions, so this may work on Louboutins and Prada handbags. Also use code "FALLNM" for free shipping. Update: the Guerlain Spa at the Waldorf Astoria has shut its doors. So, I'm guessing their spa deal won't work anymore :( Thanks to Deme for letting me/us know! If you signed up for early access, SpaFinder deal days are now open for booking! I must say, I'm pretty impressed with the offerings. Bliss spas, Caudalie, Clarins, and the Guerlain Spa at the Waldorf? Yes please! I've booked myself for a microderm, and I'm thinking a massage is in order too. I'd love a facial, but that + a microderm in one week might be counterproductive. Sigh. NYMag has posted a Temperley London sample sale. You know, this + James Perse makes it hard not to go to Soho over Chelsea! Past-season merchandise and press samples are up to 70 percent off at Temperley London. The Chameli coat is $839 (originally $2,795), the long Wisteria cardigan is $389 (originally $1,295), and the Flower tunic is $239 (originally $795). Through 8/22. 453 Broome St., at Mercer St., second fl. (212-219-2929); F (9:30–7), S (10–7), Su (noon–6). One of my best friends wants a particular pair of out-of-season Louboutins for her wedding, so how could I not trek over? With an 8AM conference call, I was unable to super early, but I headed over as soon as my call finished and got there around 9:20. No line whatsoever. Bag check is the mild interrogation it always is, with women begging and cajoling to keep their bags, but they are, as always, very strict. I *did* notice, however, a few women carrying their Chanel bags in the fray, so if you dare bring your Chanel bag to squeeze and smush around all the other grabby women, feel free. Shoes were a total shitshow. The racks were totally maimed! In a very strategic move which no doubt caused not a few hear palpitations, they are starting the show off with 25% off shoes stamped "BLUE". This makes Manolos around $250 and Prada shoes even $150. Women were going insane. I was pretty terrified. Unfortunately this means the racks are depleted of any red soles (except some beautiful yellow crocodile Simples that are still $1000ish), and only a few Manolos to spare. I did see, in the larger sizes, some Lanvin mary janes and Chanel strappy sandals. Clothing is also much better organized. There is the normal dresses/tops/bottoms/denims, and then everything else is by designer. I didn't see huge amounts of any one designer, although there were larger racks of Richard Chai, Rag & Bone, and Marc by Marc Jacobs (and some others I can't remember) more in the middle of the room. Everything with a "WHSE" stamp on it was 25% off, but quite a few things had the wonderful red star stamp which we all know comes into play later in the game. "Dressing room" area has been upgraded! I don't know if it was the war stories of perverts and lurkers looking at the bare asses at BWS, or the need to control theft, but they've 'walled in' the changing area and added MANY MANY mirrors. Thank the lord! And they are good mirrors, not crazy fun-house ones. So, what have I learned? If you want shoes, you need to go first thing in the morning. With the 25% off right out of the gate, women are more fervent than ever. Clothing was... ok. All the things I liked were either pretty manhandled or still over $700. Unfortunately I was on a time constraint and did not get a chance to make it downstairs to home or mens. Anyone who did can let me know how it was!! Not happening in-stores, so I suppose we'll see a consolidation sale happening again soon! There's not a whole lot left, but the prices are pretty fair. In a few minutes (starting at 11 AM EST), BillionDollarBabes is having a big 7 for all Mankind sale. They'll have mens, womens, kids, and accessories (like scarves, shoes, and bags). Intermix will give you a discount if you spend a lot and hit certain thresholds. In-stores and online. Ends Tuesday, Aug 31. If you love Fekkai hair products and you live near a Saks 5th Avenue, print out this coupon and get one free full-size Brilliant Glossing Cream, Full Blown Volume Lifting Hairspray, Color Care Anti-Fade Top Coat, or Silky Straight Ironless Straightening Balm. You just need to head over to your local Saks on Thursday, Aug 26. First come, first served, so make sure you don't have any morning meetings. I don't know which one I'm going to pick! Any recommendations? (I have the Anti-Frizz Balm, and love it, and I'm covered on hairspray.) The top coat? The glossing cream? Decisions, decisions!! Inhabit is blowing the doors off with up to 80% off old and new... AND save $40 on $200+ with code "40AUG". TheOutlet.com just got a bunch of comfortable new goodies from labels I love, so I thought I'd share! Up to 70% off.. those grey 3.1 suede boots are sooo cute. My weekend was packed with social activities (although I did make it to the Made Her Think sample sale at the last moment-- and was a bit disappointed), so I didn't get to pop over to Chelsea Market for the James Perse one. It looks like they are giving us another chance at it! Starting Thursday, the sample sale is setting up shop in Soho. YOOX is continuing their 70% off sale to the end of the month. I checked last night, and I did notice that some of the items in my Dream Box went a bit cheaper, but some did not. Kind of random, but if you have your heart set on something, it may be time to check on it. For this weekend, theOutnet.com is doing +40% off print pieces! Kenneth Cole is running their F&F. 40% off!! Use code "R2132" online or print out the email to shop in-store (here's a link to send it to yourself). Works even at the outlet shops. Ends Sunday, Aug 15, and shipping is free for $100+. 20% off all jeans today only at Piperlime with code "LOVEJEANS"
Tomorrow starts the sample sales of Made Her Think, which I've come to adore. I wore 2 of their Siren Knucklebuster rings stacked to Per Se a couple months ago, and shocked our friends, who now think I am clearly leaning towards dangerous. The sale will have necklaces, rings, and bracelets up to 70% off. Maybe I'll pop by to see what other rings they have! I really like the look of their Swallow Ring, and 70% off would make it so much easier to spring for. ShopBop has proclaimed that they have fresh, not-picked-over sale items at 70% off. But we gotta hurry. Includes bags, dresses, and denim. Update: I guess they are running a little late. The link will work, I promise. StevenAlan.com is clearing out the old to make room for the new. 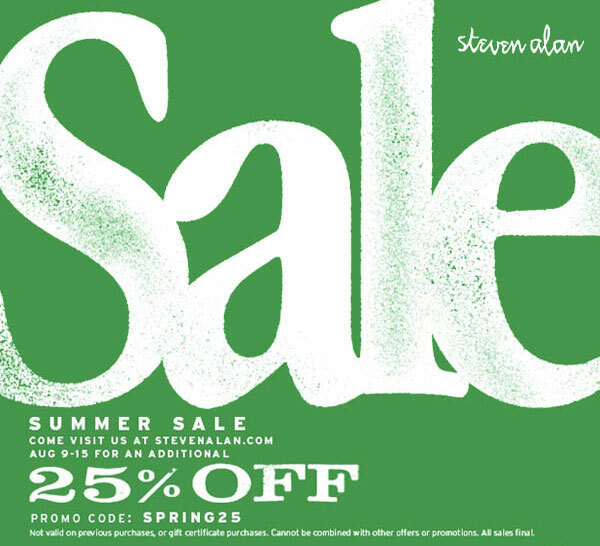 Use code "SPRING25" to take an additional 25% off all the summer sale items. I think this might work for in-store purchases as well, but I'm not 100% on that. Hallelujah, and crap at the same time. Crap because I was saving my pennies for the Barney's Warehouse Sale, and this is definitely going to reduce the size of the BWS kitty. Starting Friday, James Perse is hosting their sample sale in Chelsea Market. 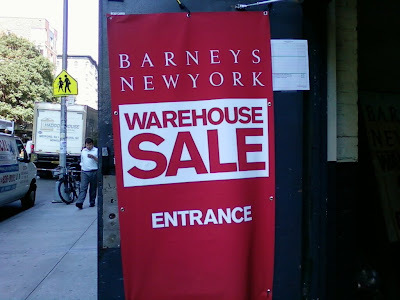 It will be their 2nd NYC sale (you can read my sale report from the one in March here), and if this one will be anything like the last one, it's gonna be very expensive for me! I can't wait!! This time, I will go EARLY so I can get some tank tops (which were the first to go last time). Some good sales starting this week. Olive + Bette is leaving their Bleecker St location, and they are having a moving sale (up to 75% off!) Among the items they'll be clearing out: Joie leather jackets for $190 (retail $760), William Rast jeans $56 (retail $192), and Vince leather leggings $250 (retail $1,000). Lauren Merkin's sample sale will have bags, clutches, and accessories up to 70% off. Today's deal on TheDealist is a $139 Brazilian keratin treatment (normally $350-450). The salon is GC Salon & Spa, which has generally positive reviews on Yelp, although none pertaining to hair services. Tomorrow at 10AM EDT, theOutnet is having their big Missoni sale. Prices will be up to 70% off, and they'll have bags, bikinis, cardigans, and scarves, among other items. So mark your calendars! Now I'm not saying everyone should use and abuse this (:P), but the Container Store has issued a 20% off code for this weekend for the college kids. Use code "CWKND10" and you can even do in-store pick-up. theOutnet.com is doing an additional 40% off a smattering of cute pieces this weekend. 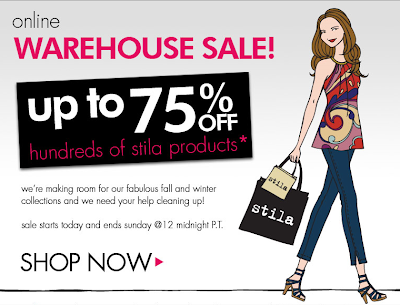 Stila is having an online warehouse sale! Some very nice prices too. Ends Sunday, Aug 8. Update: Racked.com has a great post on what's available (shoes are only sizes 37-40), and according to them, they aren't checking names at the door! Starts today, and it's big. Like 8,000+ pieces big, AND they are replenishing. Right now it's F&F only, so make sure you're there at 2. If you or your babies need some lux cotton basics, head over to The Prive's trusty sample sale area in Chelsea Market. Prices will be 50-75% off, and personally I think their sales are always fantastic. A nice collection of items are now up to 50% off at Ella Moss' online private sale. I suppose I should also mention that RevolveClothing.com is also having a big sale! Reverse (sister site of Revolve) is having sale! You'll have to log in to see the goodies. Today was a fun day of light-fixture shopping, and is it just mine, or do all men turn into big whiny babies when they go to ABC Carpet & Home? I swear DH could just not stop b*ing and moaning, calling it old, ugly, and overpriced. How is it that when it comes to furniture, he turns into a freaking Architectural Digest stager? After 2 floors, I had to leave, and we had a much more amicable time at Design Within Reach. Well, the directions are simple. Now, it will bubble and steam as the baking soda reacts with the tarnish, so try and keep your nose out of the fumes-- it made me sneeze! It doesn't smell pleasant, but it's not so bad, and the bottom line is.. it WORKS!! It works so much better than that crappy paste I keep under the sink (not to mention no scratch marks from rubbing too hard), and it gets in all the crevices of the jewelry, the ones I can't reach with a polishing cloth. I actually did it twice to some pieces which were a bit more intricate and had more nooks and crannies (i.e. David Yurman)-- and they are REALLY bright and shiny now. Now I just need to go buy more baking soda so I can do this to more of my silver. NEVER again will I do my annual ritual of dutifully bringing all my T&Co jewelry in for polishing at $8 a ring! !